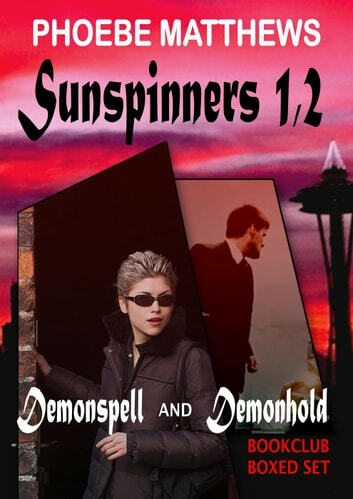 This BookClub edition includes the first two Sunspinners novels. Demonspell, or Curse of the Everlasting Relatives. Book 1. Along with a big house and income, Elaine inherits five immortal relatives who need constant attention. Try keeping a husband with that set of in-laws. Yes, she has tried. Twice. And failed. Now, just when she meets a new guy, a band of demons demands Elaine and her family leave Seattle immediately, alive or dead. Demonhold, or Blight of the Deadly Demons, Book 2. A new wave of demons decides to kidnap one of the elderly relatives. Guess who has to figure out how to save him. From the author of the award-winning fantasy Mudflat Magic series, here is another series set in contemporary Seattle, across town. Matthews has been published by Avon, Dell, Holt, Putnam and Silhouette.